This voracious pelagic species is one of the most impressively colored game fish swimming off Miami. Running into schools of dolphin is a common occurrence while offshore fishing in Miami. Dolphin follow current rips and Sargasso weed lines where they prey on virtually anything that fits into their mouths. Tuna, jacks, sardines, squid, flying fish, shrimp, crabs, and even juvenile dolphin (to name a few) are all on the menu. 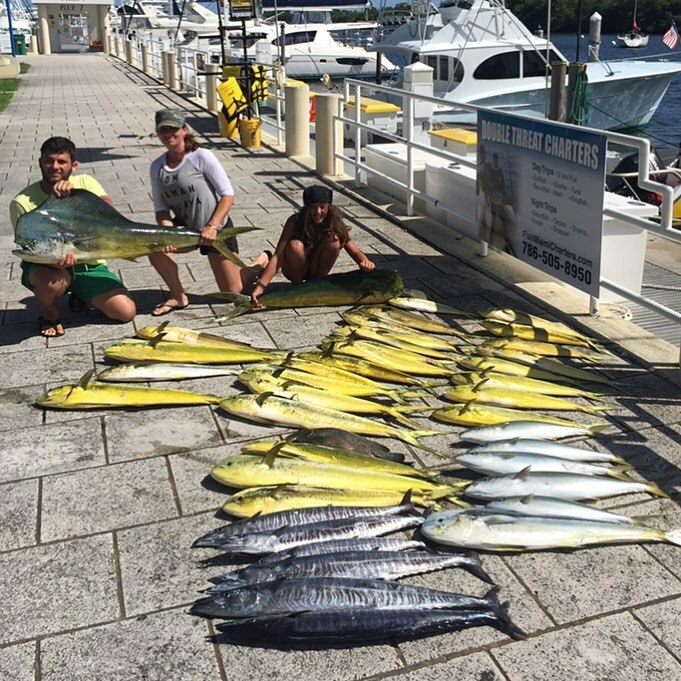 While deep sea fishing for dolphin we employ many different methods to find these fish. These methods depend on the season and conditions. Dolphin, otherwise known as mahi mani or dorado are definitely a crowd pleaser. During summer we typically run offshore until we find water that looks promising. There are quite a few indicators that suggest whether or not dolphin should be in a particular area. Indicators include birds working an area, seaweed, current rips, and more. We typically find productive water and then proceed to work the area. Trolling for dolphin along weed lines and current rips with an assortment of lures and baits is one productive method to cover ground and find the fish. We also sight fish by putting a captain in the tuna tower and having a mate ready with a live bait. There are four main methods for finding dolphin. Chasing birds, working rips/weed lines, live baiting free swimmers, and finding floating debris. Not all birds are created equal. They all have their niche and flight patterns. Understanding different types of birds and their migration as well as feeding methods is crucial for catching more fish. There are several main indicators for whether or not birds are chasing dolphin. The first indicator for finding productive birds is speed. Dolphin never migrate more than about 6 knots unless they are aggressively chasing flying fish. If you see birds flying at 20 miles an hour, don't bother chasing them. If they are moving at 10 knots or so, they are likely chasing tuna. If they are appear to be flying close to 15 mph and diving in random areas, they are also likely on tuna. 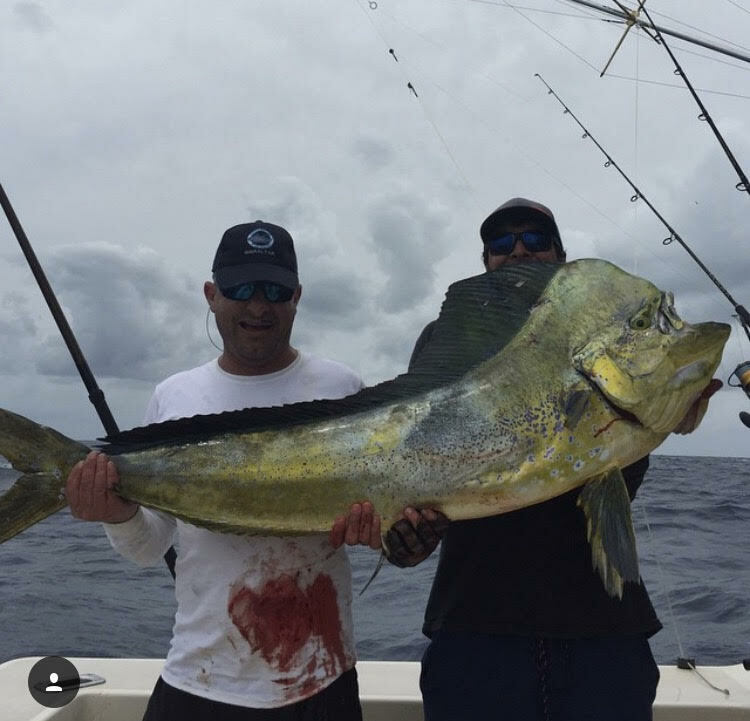 While mahi mahi usually stay up top, tuna swim deep then pop up in different areas. Birds that are on tuna are usually moving faster and more difficult to approach than birds on mahi. The second indicator of a productive birds is elevation. White birds and gannets usually stay pretty close to the water if they are on a school of fish. They usually dip and dive erratically while moving in a general direction at a reasonable pace. If you have a big flock of birds moving slowly and staying low, they are often on a big school of smaller fish. You can usually drive right in front of their heading, pitch live baits, and it's game on. Another type of bird that can be productive is a frigate bird. Frigate birds feed mostly on flying fish. If these birds are up high, they are sometimes following a school of fish or a few bigger fish that hasn't found bait. If the dolphin find flying fish or anything that sparks a feeding frenzy, the frigate birds dive to the water signaling that there are aggressive fish in the area. Another important indicator is direction. Dolphin are usually swimming south during spring and early summer. During late summer they are moving north for the most part. Noticing which direction birds are heading allows you to determine whether they are probably on fish. It also allows you to cut them off and get baits in front of them. Weed lines or rips (current lines or edges) can be very productive for dolphin. We like to troll down weed lines with 4 baits out. We could deploy more lines but if we hit a big school we are quick to switch to spinning gear. Trolling 2 ballyhoo and 2 feathers is usually adequate for covering ground and determining if there are fish in an area. Some weed lines hold fish and some are barren. Depth of the weed line and biomass are important factors. The more bait the better. Look for small jacks, rudder fish, flying fish, etc. These forage fish are dolphin candy. Weed lines that hold more bait often hold more fish. In addition, examine depth. Weed lines in deeper water or more importantly, blue water will hold more fish. Sometimes dolphin can be caught shallow but for the most part they like north current and blue water most frequently seen in the gulf stream in 300-2000ft of water. While trolling a weed line, look for schools or individual fish up top either throwing a v-wake, jumping while feeding, or just free swimming if you have a tower. Floating debris (floaters) can sometimes be the easiest way to have a banner day on dolphin. Buckets, pallets, pieces of wood or bamboo, and just about anything you can imagine can hold fish. These pieces of debris serve as shelter for bait fish and eventually create their own ecosystem as the bigger fish follow. On some days all of the floaters hold fish and some days only a few. I have noticed a correlation where debris hold more fish if they are in the middle of nowhere. These oasis style floaters usually hold more fish with everything in the area congregating to one spot. If you find a floater, it is best to switch from trolling to live bait. Bail as many fish as you can and be careful not to "sting" fish with poor hook sets. If you are careful you can catch the entire school. If you are sloppy the fish may become weary and shut down/ stop biting. There are four main techniques for catching dolphin. Trolling, live baiting, dead baiting, and kite fishing. Trolling is the most effective method for covering ground while dolphin fishing. It is great for traveling from one area to the next. Sometimes you hook up "in the blind" and if you are careful you can real the fish to the boat and hope a school follows. If you are able to bring the school in, a single fish on the troll can turn into a box full when you start pitching baits on spinners. Always leave at least one fish in the water so the school lingers. I find it better to leave fresh fish, not green or dying dolphin. When the dolphin lose color they signal to the school that they are in distress sometimes causing the fish to stop biting. Our typical troll spreads consist of 4-6 lines. Ballyhoo combos and small feathers work for fish of every size. Drag them at 6-8 knots and keep your eyes out for weed lines, birds, floaters, and more. Live baiting for dolphin is usually reserved for when you find a school of fish. We like using 20lb class spinners with 5/0 j-hooks on 50lb leaders when live baiting for dolphin. Hooking baits through the nose, pitching them, and letting the dolphin eat is a great way to get bites and not miss a hook-up. We sometimes hook up to 6 fish at a time and boat them one at a time, de-hooking and pitching fresh baits as we go. If you get into a groove you can clean out a school pretty quickly. Dead baiting for dolphin is also effective if they are very hungry. Chunks work well on hungry fish and are actually a preffered method because the hook up ratio is near 100%. You can also save a lot of live bait for finicky fish by catching them on chunks. 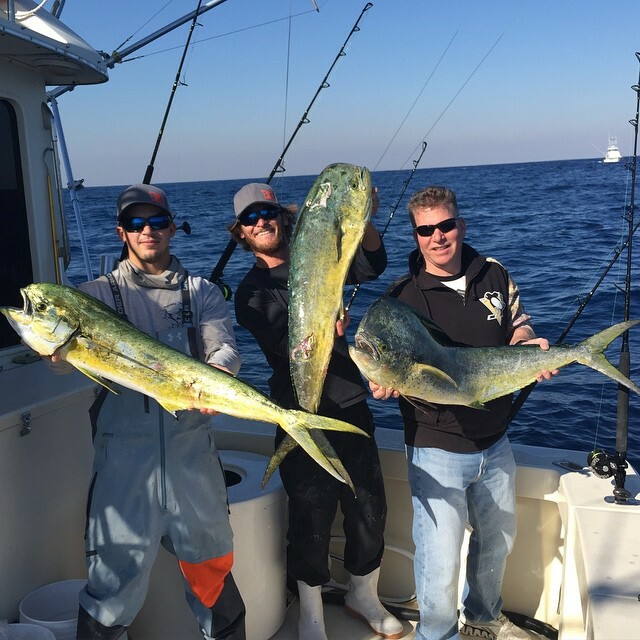 In addition to a nice trick when you are in a school of mahi, many smaller boats like chumming and chunking weed lines and patches hoping to bring in a school. This requires patience but can be very effective if you get lucky. Another great technique for dolphin is kite fishing. Dangling 6 lines on the surface is great for a variety of fish and dolphin are one of them. If there is blue water and current on the edge, dolphin are a welcome guest that are often mixed in with other species. If we hookup a dolphin on the kite we get ready with spinning rods and hope that more follow. Some of our biggest dolphin have been caught kite fishing.